If you want your relationship with the person you love to last a lifetime, it is important at the outset to know as much about him/her as you can. How well do you know the person you are thinking of sharing your life with? These books can help open an important and helpful dialogue by making explicit what each partner really wants and expects in the relationship. This is a set of 2 books—part journal, part scrapbook and part diary with coil bindings to allow the books to lie flat for easy writing! You fill out one and your partner fills out the other. Then, at a pre-arranged date, you switch them to read each other’s answers. There is a section in the back to note down comments and questions which can be discussed at follow-up meetings. Great gift for: the bride and groom, any couple about to enter into a new relationship, and couples already in a relationship and want more. What others are saying about "Partners Forever?" ​This book should be at the heart of every marriage. Ms Petersen has not only created a communication tool that fits into every fast-paced lifestyle, she has also made it easy to say things for those who may have trouble expressing themselves in a face-to-face conversation. A great conversation starter, and finisher! Well done! Authors, 101 Tips to Make Your Marriage WOW!! Dominique’s books offer an eye-opening, honest approach to relationships. Whether you choose to share your thoughts with a friend (“Girlfriends Forever”), or want to know more about your partner (“Partners Forever?”), when you open your eyes to a world of discovery through these books, you may be surprised at what you learn about yourself! This little booklet will help you create a more loving relationship with your partner, as you share special moments together. ​Try out some of the suggestions and enjoy each other’s company. Listen to, share with, and become your partner’s best friend. 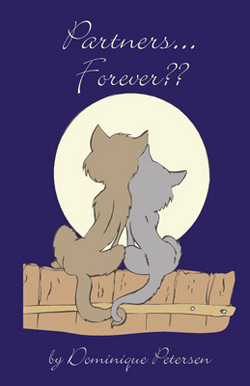 This booklet is included FREE when you order the "Partners Forever?" set.